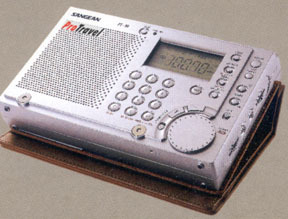 The Sangean PT-80 ProTravel is a compact digital radio featuring longwave, AM, FM plus continuous shortwave coverage. The PT-80 employs a dual conversion PLL synthesized circuit yielding excellent sensitivity and image rejection. It offers five tuning methods: direct keypad frequency entry, autoscan, manual tuning, memory recall and rotary knob tuning. 45 memory presets are available with ATS Auto Tune System. A dial lock is featured. 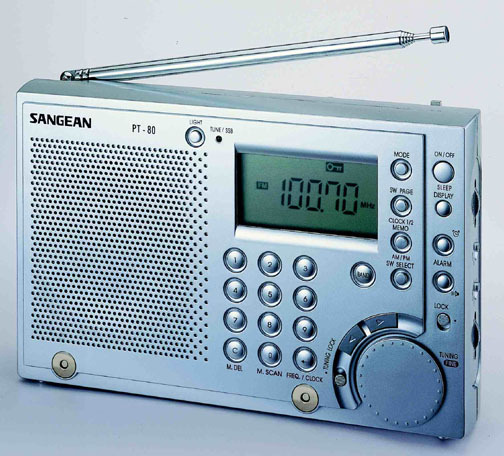 There is an indicator on the LCD that tells you whether our not you are tuning a shortwave broadcast band or not. Single sideband (SSB) shortwave reception is supported. An SSB fine tuning control on the right side panel allows for accurate SSB clarification. The left side of the radio has switches for Stereo-Mono and for Local-DX. A dual world time clock (12/24 hour) with alarm, snooze and sleep is featured. The LCD is backlit and there is an external antenna jack for the shortwave band. There is even a way to program five operation preferences (such as time display format, AM channel spacing, etc.). The PT-80 includes: 120 VAC wall adapter, earphones, ANT-60 wind-up antenna and butter-soft hand crafted leather pouch. Copyright 2004-2014 Universal Radio, Inc.